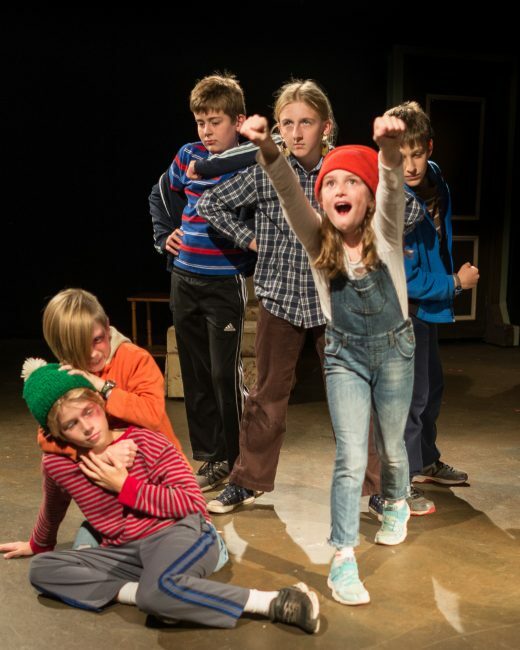 Some of the cast of “The Best Christmas Pageant Ever” at Silver Spring Stage. Photo provided by Silver Spring Stage. ‘Tis the season for church parents and Sunday School teachers to stress out about the annual Christmas children’s program and whether you’ve experienced the “joys” of wrangling your own production (or children) into place or if you’re new to the experience, “The Best Christmas Pageant Ever” now playing at Silver Spring Stage has something for everyone to relate to in this festive, funny, and surprisingly sweet reminder of what truly makes Christmas joyous. The majority of the cast are children and what a fabulous job they do in sharing this delightful story of a church Christmas pageant going wrong but ending up right. Determined church member Grace Bradley, played by Kelli Boyd, gets talked into directing the children’s program when the veteran director is injured. She’s confident that she can pull it off until the small town’s unchurched, disruptive Herdman siblings (all six of them!) show up and take over the show. Their unorthodox interpretations of nativity events lead to a lot of humor and some genuine feels in the ensuing production. My favorite character was the wildly comedic and emotionally explosive Gladys Herdman, played with pizzazz by eight-year old Alice Levings. Gladys appropriates the role of Lead Angel and is determined to really wake up those shepherds and get them charging towards Bethlehem. Levings has a wonderful range of dynamic gestures and is vocally expressive with her many hilarious lines. Another standout role was older sister Imogene Herdman, played with finesse by eighth grader Lottie Doughty. Doughty begins the play as mean and tough as can be but gives us a nuanced transformation into a more thoughtful and tender-hearted teenager as the play progresses and I was quite touched by her final scenes. Pageant director’s daughter Beth Bradley, played by Tori Newby, carries the show with her captivating narration, leading us from one scene to the next with just the right amount of emotional reactivity to the unfolding drama surrounding her on stage. She is adeptly supported by Michael Greenleaf who plays her younger brother Charlie Bradley. Greenleaf embodies a whiny but lovable sibling who knows better than to tangle with the Herdmans. Mia Parker Levings as church girl Alice Wendelken gives us a fabulous “mean girl” performance as she portrays a spoiled and unwelcoming diva-in-training. I also must note ten-year old cast member Stella V. Roehrig who provides live piano accompaniment during the pageant. She has outstanding technique and delivers a very mature and poised performance. Many more children round out the show, too many to list, but they all had great stage presence. I was impressed that their speaking lines were delivered clearly and audibly and their head tone and pitch when singing the carols was very well done. I enjoyed all of the adult performers as well, especially Kelli Boyd as pageant director Grace Bradley. Boyd mixed her fierce determination to succeed with bouts of bewilderment and loving moments with the children. Brendan Murray as her husband Bob was quite enjoyable as the long-suffering dad who didn’t want to participate. The set designed by Andrew Greenleaf was simple yet effective. A small kitchen table and armchair brought us into the Bradley home while stained glass panels and wooden pews took us to church. The costumes designed by Harlene Leahy were charming, from bathrobe-clad shepherds to bedsheet angels. Overall, “The Best Christmas Pageant Ever” is a wonderful, family-friendly performance perfect for taking your children or yourself to this holiday season if you feel the need for some light-hearted yet tender Christmas cheer. The short running time and tiered seating combined with a humorously engaging storyline makes it a very kid-friendly show. I recommend “The Best Christmas Pageant Ever,” directed by Andrea Spitz at Silver Spring Stage as the perfect way to get into the holiday mood. Running Time: 1 hour, no intermission. “The Best Christmas Pageant Ever” at Silver Spring Stage plays through Dec. 17, 2017. For more information, click here.